This interactive presentation contains the gas production data from all horizontal 3178 wells in the Louisiana portion of the Haynesville basin, that started production since 2008, through December 2016. This is the first time that I show production data for Louisiana, as it was made possible due to the collaboration with ShaleCast, which kindly supplied the estimated production data for all these wells, along with many insights and feedback. The Haynesville basin experienced a very rapid growth in gas production between 2009 and 2011, when it peaked at over 6 Bcf/day. In the 2 years since, production halved, and afterward steadied at a level of just below 3 Bcf/day. 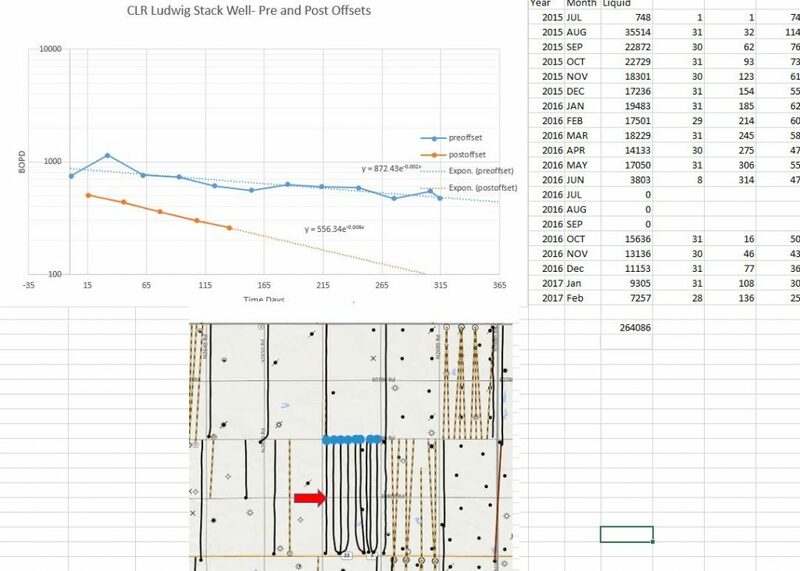 The “Well quality” tab charts the average production profiles for all these wells, grouped by the year in which they started. You’ll notice that well productivities, on average, increased until 2011, after which they haven’t change much. In the “Well status” tab you’ll find an overview of both the status and the production level, of all these wells. As you can see in the bottom graph, by Dec 2016 about 70% of the wells were at a production rate below 500 Mcf/day. This was up from a low of 25% in 2011, when new wells were still being added at a very rapid pace. The largest operators are displayed in the final tab (“Top operators”). At about 1 Bcf/day, Chesapeake is the clear leader here, responsible for over 1/3rd of total production. This “Ultimate recovery” overview shows how all these horizontal wells are heading towards their ultimate gas recovery, as their production rates drop over time. As you can see by following the red curve to the end, the average 2010 well, which this curve represents, has produced more than 3.6 Bcf cumulatively, and is after 6 years at a production level of just over 500 Mcf/day. By changing the “Show wells by” selection to “Quarter of first flow”, wells will be grouped by the quarter in which they started production, and this will show you a more detailed, and recent, picture. The 2nd tab (“Cumulative production ranking”) ranks all wells by cumulative production. One well, the “Hunt Plywood C 007”, is clearly ahead of the others, and is now close to 23 Bcf. If you change the ranking to county, it becomes clear that gas production in De Soto Parish (county) has been good for about half of the total gas production. If you’re interested in the detailed location and status of all these wells, please take a look at the 3rd tab (“Well status map”). It also shows how production is focused in and around De Soto Parish. Of interest is also the “Production ranking” tab, which ranks all operators by the average cumulative production at the 2 year mark. The 4 entities under which BHP Billiton operates in this area take up the 4 top spots. A ShaleCast specific version of the first interactive presentation shown above was created, which also shows the revenue and location of wells owned by its members, and which you can find here. 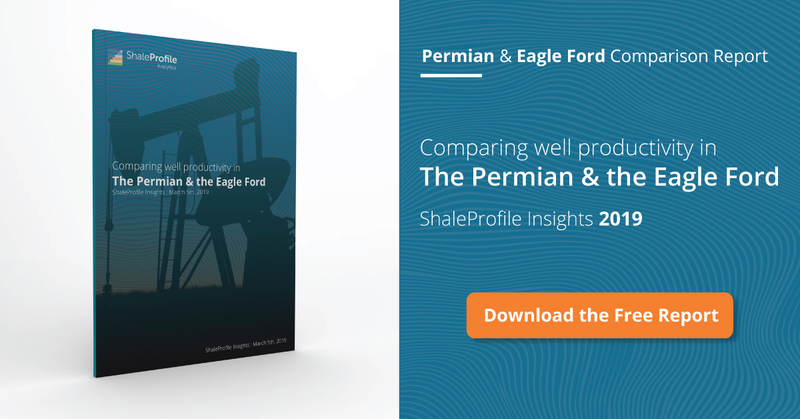 Next week I plan to publish updates on both the Eagle Ford and the Permian. ShaleCast: Individual well production data was estimated based on lease production data. Only the most recent operator for a well is known, so all production data shown in these presentations is assigned to the latest well operator. Amazing how Haynesville behave differently to Marcellus — much higher IP and much faster drop off! Yet, it also start to level off at 300-600MCFPD after 4-5 years; while Marcellus is leveling off at 500-1000MCFPD after 4-5 years. Yes, I also find the differences between the basins fascinating. Part of the levelling off in Louisiana is caused by wells that are refracked, which compensates some of the decline in all the other wells. I hope that in the future I can better show the effect of that. This is factual and great work. But one should be looking at what will enhance this production and increase the recovery also based OOIP. USP 8,733,439 teaches additional recovery techniques which reduce the fall off of production and will enhance the economics. Upto industry to spend some additional money to recover this gas at both places , Haynesville basin and establishing how Haynesville behave differently to Marcellus basin which will still be different but answer might be interesting. do you have an idea about the main reasons behind the improving productivity in the last 2 years? I have the impression that the improvements have been less extensive here than in some of the other basins. The number of new wells is also far lower than at the peak (e.g. 175 new wells in 2015 vs 889 in 2011). From the FracFocus data, I see that also here completion volumes have increased significantly over the years, so I suspect that that, together maybe with longer laterals, are important contributing factors (especially on initial production rates). Great work as usual, Enno. Have you gathered data on the average lateral length drilled each year? Then you could normalize the production per foot of drilled or completed lateral. I suspect the production improvement has a lot to do with the increased lateral lengths, as I know you have mentioned. I indeed also suspect that that has been one of the important factors. Unfortunately most states do not offer data from which the lateral length can be deduced. I’m still looking at whether I can get more data on that. If I had the data though, I think a better way to use it is to reveal the relationship between lateral length, and productivity, instead of using it to normalize production per lateral foot. The reason is that in the end what matters for the economics is the money spent on the whole operation, and this expense is probably not very linear with lateral length? The other factor to take into account is the number of completion stages. I have found that, for many unconventional reservoirs, the source of recent “increased” production (initial rates) is due to an increase in the number of completion stages. When the completion spacing starts getting tight, it seems that we are only “rate accelerating” but NOT adding new reserves for any given well. Furthermore, if the well spacing gets too tight, we are decreasing EUR per well. The subsurface properties (geology, geomechanics plus reservoir engineering) should determine the optimal (as in max NPV) well spacing and number of completion stages. Why would we expect Unconventional reservoirs to all behave the same? Excellent points. But when you have no geology or reservoir engineering, what you are left with is trial,error close-ology and trend-ology. My understanding is that very few of the unconventional wells today are even logged. Below is a montage of CLRs Ludwig Stack Well. The first well was brought on in in July 2015 and was a beast. They then offset it to the east with 8 wells, and it was shut in from July-Aug 2016. The production chart shows the exponential behavior pre and post decline. It seems the exponential decline rate has tripled. Thanks JP, also for the very interesting comment. I’ll put the # of completion stages on my list for things to look out for.